We’ve seen at least 3 leaked versions of Gingerbread (Android 2.3) for the DROIDX now, so you can imagine that we must be close to something official. And according to friends around the DL family, “close” could be May 13. 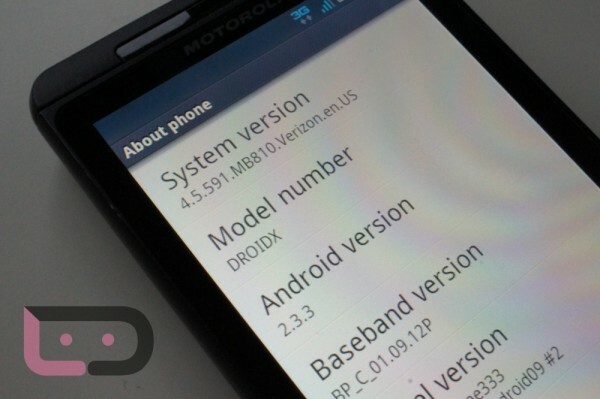 What we’ve been told is that Motorola has finalized the latest build (not 4.5.591 – something newer) and expects Verizon to sign off on it by the 6th with hopes that it can be made available by next Friday. So if it is a go, then Friday could become the test phase of a rollout with the mass load hitting users by the next week starting on or around the 16th. A lot of “ifs” in there, I know. And as always, we want to make sure you understand that this information can change at anytime and should be taken as rumor. Verizon has already rejected at least 3 builds from Moto, so there are no guarantees that this is going to be the one that finally passes through. The good news is, we’ll probably have another leak! Yes, that was cheesy sarcasm. Samsung Can't Stop Talking About the DROID Charge Today, Finally Releasing Tomorrow?